I like to make this with Feta that I've marinated for a few days in olive oil with a little thyme and some pink and black peppercorns - it adds another layer of flavour. I keep a jar in the fridge permanently, topping up the Feta as I use it. Lightly oil a baking tray. Melt the butter for the almonds in a saucepan over a medium heat. Toss in the almonds. Cook for a minute or so, till the almonds are beginning to colour. Stir in the honey and salt and cook for a further 2-3 minutes, or until the almonds are golden and the honey has caramelised. Spread the nuts out in a thin, even layer on the baking tray. Leave until set, then break into clusters. Whisk the dressing ingredients together and season to taste. Put the orange segments into a large bowl with the Feta and watercress then toss with the dressing. 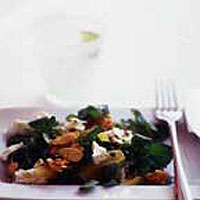 Divide the salad between 4 plates, scatter over the roast almond clusters, and serve immediately.